WASHINGTON, DC, March 18, 2010 (ENS) – The utility-scale solar industry is ready for what one executive today called “explosive growth,” and new national polling data released today shows that 75 percent of those surveyed support the development of solar energy plants on public lands. The survey of 500 U.S. adults over the age of 18 conducted from February 24 through February 26 by Gotham Research Group found that solar power was the top choice (38 percent) as the best use of public land. Respondents also selected solar farms and wind power (22 percent each) as the top energy sources that the government should prioritize for support, beating out natural gas (16 percent), nuclear (16 percent), oil (11 percent) and coal (4 percent). “It is time for our elected officials to respond to this high public demand and enact policies that allow solar to compete with other energy sources on a level playing field,” said Resch. Leveling the playing field means more research and development funding for the solar industry and government help to overcome technical and regulatory barriers to feeding solar power into the grid, Solar Energy Industries Association spokesperson Monique Hanis explained in an interview. The Obama administration is already moving towards siting utility-scale solar developments on public lands and streamlining the permitting process. In June 2009, Interior Secretary Ken Salazar and Senate Majority Leader Harry Reid, a Nevada Democrat, announced that federal agencies will work with western leaders to designate tracts of U.S. public lands as prime zones for utility-scale solar energy development, fund environmental studies, open new solar energy permitting offices and speed reviews of industry proposals. “Large solar installations use economies of scale to achieve significant cost savings and help Americans to get the most solar bang for the buck,” she said. Across the United States, five new utility-scale solar pilot plants came on line in 2009 and there are more than 100 utility-scale solar projects under development. These projects represent more than 17 gigawatts of capacity, enough to provide clean power to 3.4 million households and to create more than 100,000 American jobs, according to the Solar Energy Industries Association. “The 17 gigawatts of utility-scale solar projects proposed in the United States offer great opportunities for companies like ours,” said Tom Hecht, vice president of sales and marketing, Schott Solar, a German corporation with a North American division. While the Sun shines on every state, the sunny Southwest is attracting utility-scale solar developments most rapidly. “With a successful 10 megawatt pilot project, more than 3,000 megawatts in the pipeline, and two recent PPAs [power purchase agreements] with Nevada Energy and PG&E, we are primed for explosive growth in the United States, as is the entire utility-scale solar sector,” said Tom Georgis, vice president for development, SolarReserve. Headquartered in Santa Monica, California, SolarReserve is a solar energy project development company that holds the worldwide license to the molten salt, solar power tower technology developed by United Technologies Corporation. 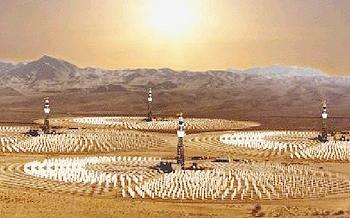 To generate electricity this way, sunlight is concentrated and directed from a large field of tracking mirrors called heliostats to a receiver on a tall central tower. Molten salt from a cold salt tank is pumped through the receiver where it is heated to 1050 degrees Fahrenheit. The heated salt flows into another tank where it is stored, maintaining 98 percent thermal efficiency, and eventually pumped to a steam generator. 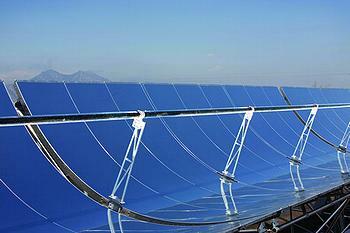 The steam drives a standard turbine to generate electricity day or night, whether the Sun shines or not. SolarReserve expects to begin construction this year on a 100-megawatt solar power tower near the town of Tonopah in Nye County, Nevada. When completed, the facility will supply 480,000 megawatt hours of electricity annually – enough to power up to 75,000 homes during peak electricity periods. In the spring of 2011, SolarReserve plans to break ground on a 150-megawatt solar power tower 30 miles northwest of the city of Blythe in eastern California. When completed, this facility will supply 450,000 megawatt hours, enough to power up to 68,000 homes during peak electricity periods. “We know that solar energy can be generated cleanly, reliably and with a stable fuel price,” said Marc Ulrich, vice president of renewable and alternative power with Southern California Edison. California’s Renewable Portfolio Standard program requires electric corporations to increase procurement from eligible renewable energy resources by at least one percent of their retail sales annually, until they reach 20 percent by the end of 2010. Southern California Edison now procures 17.4 percent of the electricity it sells from renewable sources.